DigiTech Parties aim to create parties for techno and tech house lovers with an excellent party vibes and atmosphere. DigiTech Parties prefer to strip things back and place music and sound at the centre of its experience. 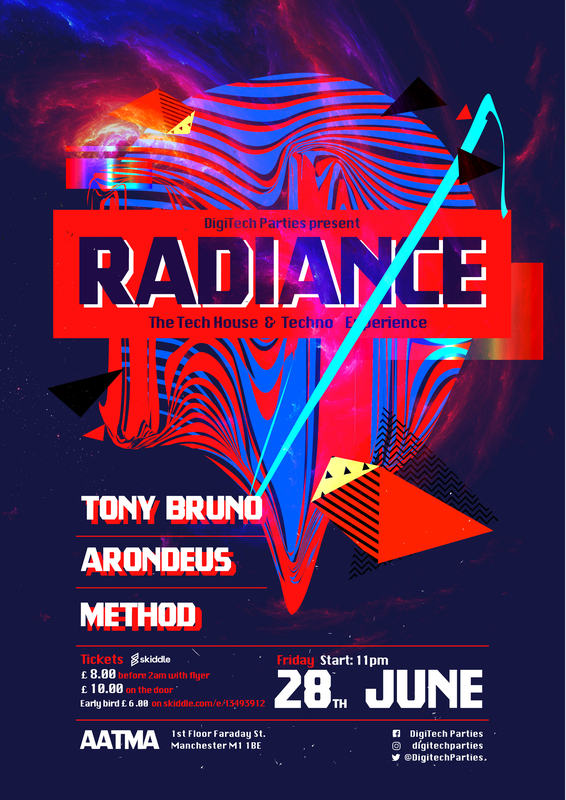 Radiance is a club night that aims to exploit the venue’s raw attributes. Techno music is the best it has been for years there’s a whole new wave of heroes churning out tune after tune and our DJ line up will play some absolutely ridiculous tunes. Digging in to unearth some dance floor damage Aatma we have Method (Manchester), Arondeus (Chester) and Tony Bruno (London). It’s fair to say that any underground techno music lover will be securing some of this action. For the party animals out there get the party started at 11pm. Tony Bruno, DJ & Music Producer born in Italy and now proud Londoner, this renaissance man of music has been in the centre of clubbing and music scene from way back in the 90s. He was instrumental in the success of Exogroove parties across Italy as well as scoring several major Dance hits. In 1999 he moved to London and he has picked up his music career with some brilliant DJ sets along the Techno, Progressive House, Tech House, Deep, Melodic or Dark Techno sound that is so sought-after all-over Europe. Tony has played at clubs in Germany, The Netherlands, Spain, Belgium, Italy, Ireland, Russia and Israel. We welcome Tony to Manchester and Aatma. Arondeus likes to mix it up, playing driving techno that takes in acid, jacking, wonky, ravey and industrial sounds (with the occasional disco moment), but always with one eye firmly on the dancefloor. He cut his teeth dancing in clubs and parties back in the 90s through to the present day – and he’s a raver first and foremost and is as informed by the punk and free party approach as by dance music culture. Always using 3 or 4 decks, and often bringing along the drum machine and synth for added crunch – no set is ever the same. He’s played in Europe and around the UK and holds down a residency at Nexus. Adrondeus has a 3-hour monthly radio show on techno.fm which showcase the best in proper techno from around the world.